Providing you the best range of articulated forklift and side way reach electric stacker with effective & timely delivery. 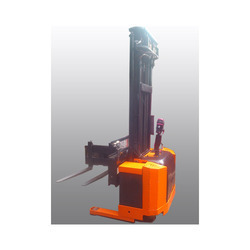 With rich industrial experience, we are renowned as one of the leading manufacturers and suppliers of excellent quality Articulated Mast Forklift. Our forklift is checked from our side for ensuring its flawlessness before the delivery. This forklift is manufactured at our highly advanced manufacturing unit utilizing the finest quality material and sophisticated techniques. 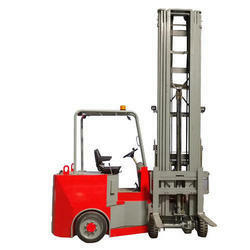 We provide this forklift on several specifications so as to meet the needs of customers. To keep the client satisfied, we manufacture & supply high quality Reach Electric Stacker Side Way. This electric stacker is developed using prime grade material and leading techniques in conformity with the set standard of industry. Our offered product is widely acknowledged by our customers owing to its superb quality & finishing. Customers can easily avail this electric stacker from us at the most reasonable prices.